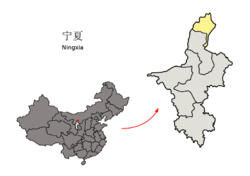 Shizuishan (Chinese: 石嘴山; pinyin: Shízuǐshān) is a prefecture-level city and is the northernmost and, by population, the second-largest (after the regional capital of Yinchuan) city in the Ningxia Hui Autonomous Region, and is bordered on all sides except the south by Inner Mongolia. It also sits on the western (left) bank of the Yellow River. In 1934, Shizuishan was occupied by the army of warlord Sun Dianying during his attempt to conquer Ningxia from the Ma clique. Sun set up a rival provincial government in the town, but he was eventually defeated by Ningxia's official governor Ma Hongkui. Shizuishan was consequently returned to Ma control. Shizuishan is located on the western bank of the Yellow River at latitude 38° 21′～39° 25′ N and longitude 105° 58′～106° 39′ E, spanning 88.8 kilometres (55.2 mi) from east to west and 119.5 kilometres (74.3 mi) from south to north. ^ Jowett (2017), p. 217. ^ Jowett (2017), pp. 217, 218.